Four days ago, I had another IE and I was happy to know that OB found a progress on my dilation. At least I got dilated for 1 cm after the hardship of walking and stretching over the long weekend. She even stripped my membranes and I had menstrual like cramps afterwards. She also asked me to take Eveprim (prime rose oil gel) that would help soften my cervix. When I got home I found some mucus plug and bloody show discharge and it lasted for 2 days. I also felt lower back aches, abdominal cramps and strong contractions such as hardening and tightening of my stomach. The excitement, worries and dread came to my sentiment. Just mixed emotions thinking that baby is coming anytime. 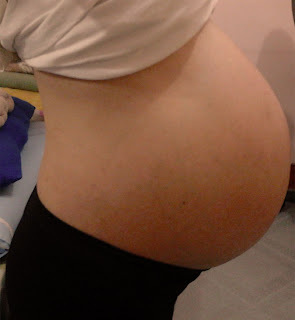 My over big tummy at 39 weeks! Well, not until today. My OB expects me to be admitted Friday or Saturday (and today is Sunday already) but I think baby has to hold it a little bit longer. She wants to prolong our excitement for another days or even weeks because true labor has not started yet. It is still 3 days before my due date anyway. Dropping/Lightening – You should feel your baby has dropped into the pelvis giving more pressure to the bladder and giving you more trips to the bathroom. - - - The bathroom has become my BFF. So for me it’s a normal thing to go there often. Bloody show/Loss of mucus plug – This is a sign that your cervix starts to thin and then mucus plug comes out. Rupture or membranes/Water Breaks – When a gush of amniotic fluid comes out. When this happens, labor should follow soon. - - - I think my water bag is still safe and fully intact. Strong Braxton Hicks Contractions – When labor draws near, the Braxton Hicks contractions become strong and sometimes painful. It can also last up to 10 to 20 minutes. - - - Yes I always experience this damn false labor! Effacement – The thinning and stretching of the cervix. This is determined by the health care provider and is measured in percentage. - - - I don’t know how many percent effaced I am. Dilation – The opening of the cervix. This can be checked during the internal exam and is measured in centimeters. At 10cm, you are already fully dilated which means you are ready to give birth. - - - Well, mine is still 1cm the last time my Ob checked me. 9cm more to go! So now I have to believe that patience is always a virtue. Though I feel pressure from other people wanting and waiting for my baby to arrive. I really want her out but she’s not ready yet. My boss even had his phone alarmed saying that baby’s out! But I’m glad because and I’m just loved by many. The best thing is that they are happy for me having a baby and having an addition to our family member. It also means that many of them are praying for my safe delivery.